Trivia question; what do the Rolling Stones, Radiohead, Deacon Blue, the Pretty Things and Judas Priest all have in common? Answer; they all took their name from other people’s song titles. The Rolling Stones from a Muddy Waters song, Radiohead from Talking Heads, Deacon Blue from Steely Dan, the Pretty Things from Willie Dixon and Judas Priest from a track on Bob Dylan’s John Wesley Harding album The Ballad of Frankie Lee and Judas Priest. 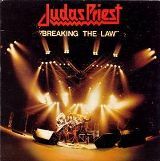 Judas Priest were formed in Birmingham as far back as 1970 and, apart from a three year hiatus in the nineties, they’re still together and perform regularly. The main line up comprises lead singer Rob Halford, guitarist K.K.Downing, bass player Ian Hill and after their record company suggested they bring in a keyboard player, they decided to recruit a second guitarist instead, Glenn Tipton in 1974. Glenn does also play keyboards, but they were the first British heavy metal group to have two guitarists. As for a drummer, well they’ve had eight of those over the years – the one with the longest tenure is Scott Travis who joined in 1996 and is still there. They grafted for seven years before they saw any kind of chart action. The albums Rocka Rolla (1974) and Sad Wings of Destiny (1976) failed to excite the public, but then in 1977, their third album Sin After Sin reached the top 30. Two further albums followed, Stained Class (1978) and Killing Machine (1978) saw chart action too, but then in 1979 they hit the top 10 with Unleashed in the East. Their most successful album came the following year when British Steel reached number four and the first two singles lifted from it, Living after Midnight and Breaking the Law both reached number 12. Breaking The Law tells the story of someone who gets tired of everything that comes with an ordinary life – a life that had become boring. This leads the person to take a chance and start breaking the law. It comes complete with a couple of sound effects of police sirens and glass being broken which, in the days before sampling, were either taken from a sound effect record or making the noises live. The police siren was produced by guitarist K.K. Downing using the whammy on his Stratocaster, but as for the breaking glass, that was real. Rob and Glenn literally smashed empty milk and beer bottles in Ringo Starr’s house to capture the sound. The video featured the band as bank robbers with Rob riding in a Cadillac towards the bank, singing the first verse, then meeting up with the rest of the band at the bank. They then break in and use their instruments to bring the customers to their knees. Next they break into the safe and steal a gold disc for the parent album British Steel, which was slightly ironic as, at that time, it hadn’t yet gone gold. The security guard is seen sitting in his room sleeping in front of the security TV, but is awoken by the loud music and instead of doing something, he just looks in awe at the TV. As the band are leaving the security guard picks up an air guitar and starts playing along. That video is ranked at number 40 on VH1’s 40 Greatest Metal songs list. Breaking The Law can be heard in the Beavis and Butthead movie, they used to sing it when they did something knowingly illegal. It’s also been used in the Jus-Rol pastry TV advert which shows a working mum whipping up a chicken and pesto pastry tart for her children in a matter of moments, while dancing round the kitchen. The band also performed a parody of this song in January 2014 during the 25th season of The Simpsons in the one called Steal This Episode where we see an enthusiastic FBI agent in charge of anti-piracy goes after Homer, after he starts illegally downloading films and goes into hiding. The band perform a spoof version of the tune in an effort to lure him out.